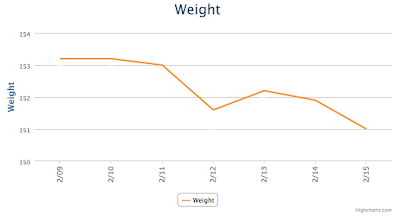 I came up with my goal weight because I looked back in MyFittnessPal to see what my lowest weight has been. I was 126 lb on July 8th, 2012. That was almost five years ago when I was running a lot. I lowered it to 124 because that is what I have found for BMI that is the high end for my height to be a normal weight. Once I hit that weight I'm going to see how I feel, and I'm going to get a more accurate body fat % test, then I will see if I can lose more or stay there. Last week I saw a new coach and she was really funny. She was honest and made me feel better. She told me now I was open to all the foods so I bought some chips, guiltless cheesecake, pizza and microwave soup. I like the chips, I think I have a thing with crunchy. The cheesecake has a weird taste but it good with PB2 added. The soup was a little oily or something. The beef wasn't bad but once you get to buying these foods they are more expensive. The pizza wasn't bad, a little card board like, but good for dinner in case I need it because it does count as 1 oz protein. I really do need to be better about keeping track of what I eat, as I have been playing it by ear. So far it hasn't affected me but it might once I go to the next phase. I was told this would be when I'm at a 20 lb loss. I also stopped working out since last week. I have no motivation. I have also been busy with church and the kids. I know I could fit it in because it isn't that long of a workout, but since I have still been losing weight I don't see that as important. I have been wearing my apple watch which lets me know to stand up, so I make sure I do that when I get the alert. My appointment is tomorrow and I was supposed to be looking at the knowledge sheets on stress relief, but I haven't yet. I have tried to be more chill but it has been hard with the construction work in my basement. I also just dropped a load of cash on summer activities, with more to come. We also bought a new bed. We had a mattress that someone else bought and didn't like. We put a foam topper on but lately, my back had been hurting. The new mattress does seem to make a difference. I figured it would help me sleep better too, but not sure if it is my diet change or the mattress.